As a diligent printing company, we shop around for our clients, calling all the distributors for the best price on the particular item that our client requests. Each distributor has weekly sales, so we have to call around to find out who has the best deal on the item that our client needs. Once we get the best price, we can order the items and usually get them into our customized shirts printing facility within a day or two. In the case of a backordered item though, it can take longer. Sometimes a lot longer. But that’s the nature of the business. This is a premium brand, known for being made in the U.S. The AA#2001 is the unisex t shirt that seems to be their best seller. They offer a tighter fit than many other brands, and people consider them the softest cotton brand. Are they the softest? In my opinion, yes, but the cost will be almost twice as much for this brand. Hanes, Gildan, Fruit of the Loom, or any other “standard” brand will save quite a bit of money. They offer a lot more than t shirts. They have retail stores where one can touch and feel their products as well. The Gildan 2000 is a very popular t shirt. It offers a boxier look that the more fitted American Apparel, and many prefer it. Again, it’s all about personal preference. Gildan is cut bigger than AA though, so keep that in mind when choosing sizes. They also offer nice polos that are reasonably priced. They do a lot of advertising, don’t they? Yes, we see them all over TV with their Michael Jordan commercials, and perhaps because of that, they are a popular brand, but they’ve been around for a lot longer than those commercials. A reputable brand that is cut similar to Gildan, and a safe middle of the road bet. It’s possible to opt for the Hanes 5180 6.1oz ringspun Beefy T or the Hanes 5280 5.5oz Heavyweight when it comes to t-shirts. Good quality 100% cotton and 50/50 polos are available as well. This company is the oldest, but for some reason they are not as well-known to the younger generations as some of the other “hotter” brands. this could be because they stopped doing much of their mass advertising a few years ago. My guess is that they have become so entrenched with the older generations that they don’t think they need to advertise, but that will change when the older generations become…older. The shirts are good quality and I’ve never had a complaint about them. the 3930 is 100% cotton and one of my go-to shirts, especially popular with custom t shirt printing for schools. They also offer nine different polos, both with and without chest pockets. 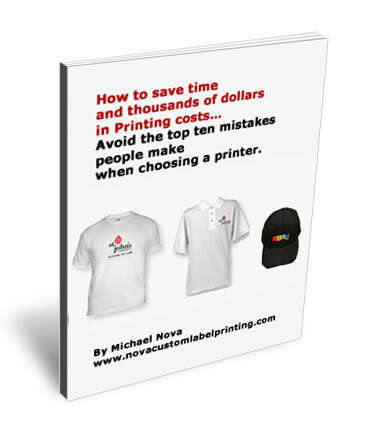 This article on Customized Shirts was written by Michael Nova.